Poker is all about skill, even though there’s an element of luck. A lot of newcomers focus on the luck and ignore the skill, causing them to get typecast as donks, fish, and everything in between. You need to make sure that you are watching for the various types of players in poker. 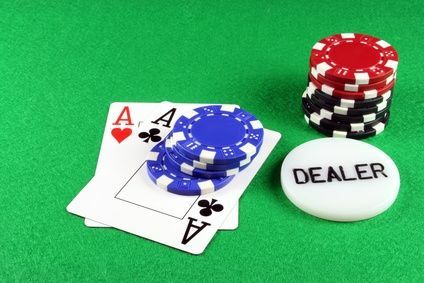 If you have any dream of becoming a veteran poker player, you have to study your competition. How do you win with weak cards? It’s easy — you learn how to measure up your opponents. You see if they’re a shark or a fish. Yet we won’t dare say that it’s as simple as being just a shark or a fish. The reality is that you need to look at the wider field of poker player types. Some of these types can be better seen through poker programs like poker edge, but your mileage may vary. The calling station is a player that does exactly what you might imagine — they call a lot! Loose-passive play pre-flop (calling without ever re-raising), and passive play after the flop comes down (just checking or calling minor bets, never getting aggressive.) You don’t want to bluff the calling station — they run on luck, so they’ll just end up calling anyway. They also have a tendency to keep absolutely loser hands, hoping for a freak flop that happens to benefit them. Keeping 72o and praying for a 7-7-2 flop is a little short of madness. The Maniac — Wilder Than You Know! The manic is truly erratic. They play just about every hand, and they tend to be incredibly aggressive. They love bluffing you. They can drive you crazy because they go all in a lot, or they shove when they aren’t holding anything. They can also be a little mean on the social side, calling you out for your donk calls or calls that are a bit questionable at the very least. The truth of the matter is that you have to slow play them when you have something good. They can fold like a house of cards, or push you to the limit. If you master maniacs, it feels like you can master just about anything. You’ll find super-tight players in every range of poker you can think of. These are people that play a tight range of hands preflop and get aggressive on all streets when they actually play. The rock understands some idea of poker position, but they waste the advantage of late position by playing too few hands. This creates vulnerabilities. You can steal their blinds by raising preflop to indicate that you’ve got something. TAG’s (tight aggressive players) are pretty decent at poker. They give newbies a hard time because they’re going to shove you around. They know poker position and they use it to the fullest. So if you’re not familiar with poker position, you really need to brush up on it. You can indeed take advantage of TAGs on the table by exploiting post flop play. Study your flops. See what they do when you raise. You can steal a LOT of pots through these actions. Make sure that you’re staying aware of what your opponent is doing. It’s easy to get the wrong read on a player. Aggression should be this player’s middle name. They absolutely love it, and they want to make sure that you know it. The best thing that you can do is push this “maniac light” player to the value bets. Strong hands are important, and you want to make sure that you don’t play hands like AA lightly. Make sure that they know you mean business. You’ll get better at reading poker types in good time. Make sure that you really do study more about poker image. It can really take your game to the next level!